Scenario-based assessments (like this one, for example) are a great way to test learners’ understanding of a specific subject or gauge how someone would react in certain circumstances. 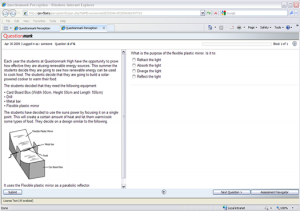 You can create scenario-based assessments in Questionmark Perception version 5 by grouping a series of questions with a single stimulus such as a reading passage, case study, video, image or audio track. 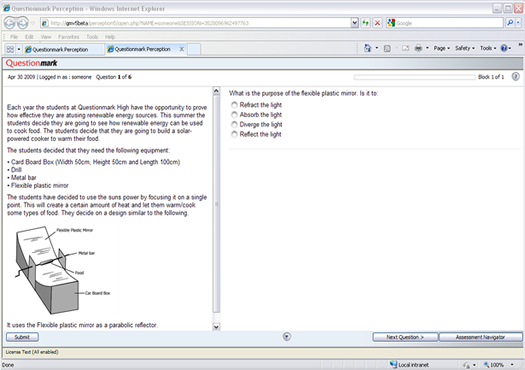 To do this, you would select the appropriate template within the Perception Assessment Wizard to group related questions into a single block. You use text and images to create a static introduction or stimulus that would remain visible in on one half of the window while the questions related to it show up one at a time on the other half. You can create questions as you would any normal set of questions. Group them in a single sub-topic or place the questions in other relevant topics. Once your assessment is complete, you can schedule it like any other assessment.